Traumatic optic neuropathy (TON) refers to an acute injury of the optic nerve secondary to trauma. The optic nerve axons may be damaged either directly or indirectly and the visual loss may be partial or complete. An indirect injury to the optic nerve typically occurs from the transmission of forces to the optic canal from blunt head trauma. This is in contrast to direct TON, which results from an anatomical disruption of the optic nerve fibers from penetrating orbital trauma, bone fragments within the optic canal, or nerve sheath hematomas. The image below depicts traumatic optic neuropathy. Plain film radiograph of a 2-year-old girl following blunt periocular trauma. 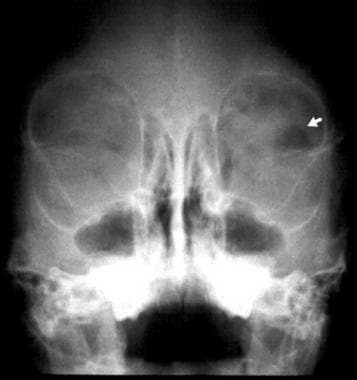 Although a left orbital wall fracture is not evident, a loculated pocket of intraorbital air is highlighted by the arrow. Patients with traumatic optic neuropathy (TON) can present with a variable degree of vision loss (decreased visual acuity, visual field abnormalities, or loss of color vision). Most cases (up to 60%) present with severe vision loss of light perception (LP) or worse. In the acute phase, the optic nerve usually appears normal on funduscopic examination, but optic nerve atrophy is often seen 3-6 weeks after the injury. The vast majority of TON cases are seen in males (up to 85%), with a mean age of 34 years. Motor vehicle and bicycle accidents account for the majority of causes, followed by falls and assaults. TON has also been associated with penetrating orbital trauma (eg, stab wounds, pellet and gunshot wounds, foreign bodies) and recreational sports (eg, paint ball injury). The pathophysiology of traumatic optic neuropathy (TON) is thought to be multifactorial, and some researchers have also postulated a primary and secondary mechanism of injury. In indirect TON cases, the injury to the axons is thought to be induced by shearing forces that are transmitted to the fibers or to the vascular supply of the nerve. Studies have shown that forces applied to the frontal bone and malar eminences are transferred and concentrated in the area near the optic canal. The tight adherence of the optic nerve’s dural sheath to the periosteum within the optic canal is also thought to contribute to this segment of the nerve being extremely susceptible to the deformative stresses of the skull bones. Such injury leads to ischemic injury to the retinal ganglion cells within the optic canal. A secondary mechanism can result in optic nerve swelling after the occurrence of the acute injury. The optic nerve swelling can exacerbate retinal ganglion cell degeneration by further compromising the vascular blood supply, either through a rise in intraluminal pressure or reactive vasospasm. These secondary mechanisms, in theory, form the rationale for optic canal decompression via medical (ie, steroids) or surgical means (ie, bony decompression). Finally, the intracranial segment of the optic nerve may be damaged by forces delivered to the axons by the shifting of the brain following head trauma. With this mechanism, the nerve fibers may be injured against the falciform dural fold or through a shearing force where the nerve becomes fixed as it enters the intracranial opening of the optic foramen. The human orbit is composed of seven bones that comprise 4 walls: the roof, lateral wall, medial wall, and floor. The 7 bones include: ethmoid, frontal, lacrimal, maxillary, palatine, sphenoid (lesser and greater wings), and zygomatic bones. The 4 orbital walls converge posteriorly at the apex of the orbit, and the optic canal is located within the lesser wing of the sphenoid, which is one of the bones that comprise the orbital roof. The optic canal is separated from the superior orbital fissure by the optic strut of the sphenoid bone; hence the optic strut comprises the optic canal's lateral wall. The canal's medial wall separates it from the sphenoid sinus. Structures that pass through the optic canal include the optic nerve sheath and axons, their supportive glia, the ophthalmic artery, and branches of the carotid sympathetic plexus of the autonomic nervous system. The optic nerve is a cable of retinal ganglion cells that enters the eye approximately 4 mm nasally and 0.8 mm superiorly from the center of the macula at the posterior pole. Inside the eyeball, the anterior optic nerve forms the optic disc, which is visible clinically with funduscopic examination as a pink, slightly elevated structure centered upon the opening in the posterior sclera. The optic nerve is a collection of axons (approximately 1.2 million) originating from the retinal ganglion cells. With its meningeal sheath, the optic nerve is 3-4 mm in diameter and its total length measures approximately 50 mm from the globe to the optic chiasm. The nerve is composed of intraocular (about 1 mm), intraorbital (20-30 mm), intracanalicular (5-11 mm), and intracranial (3-16 mm) segments. The axons transmit visual stimuli from the retina to the eight primary visual nuclei in the lateral geniculate nucleus. The topographic organization of the axons, as arranged by the retina, is relatively preserved within the optic nerve. In addition to the visual input that it carries to the lateral geniculate nucleus, the optic nerve also carries afferent fibers that participate in the pupillary responses. Except for its intraocular segment, the axons of the optic nerve are myelinated. Similar to the cerebral white matter, the optic nerve is ensheathed by oligodendrocytes, which are responsible for the production of myelin. Astrocytes are also present within the glial septa, and they provide nutritional support to the axons. Throughout its intraorbital course, the optic nerve remains surrounded by pia, arachnoid, and dura mater, which move along with the optic nerve during normal eye movements. Within the optic canal, the sheath of the optic nerve is fused to the sphenoid periosteum, and, as a result, the nerve and its sheath are tightly fixed to the bony canal within this confined space. At the posterior foramen of the optic canal, the optic nerve sheath fuses with an overlying falciform fold of dura that lines the calvaria. Pial branches of the internal carotid, anterior cerebral, and anterior communicating arteries perfuse the intracranial optic nerve. Small pial branches from the ophthalmic artery supply the intracanalicular optic nerve. The intraorbital optic nerve is also supplied by perforating branches derived from the ophthalmic artery. The arterial circle of Zinn-Haller supplies the intraocular optic nerve with contributions from the posterior ciliary arteries, the pial arterial network, and the peripapillary choroidal vasculature. Gise R, Truong T, Parsikia A, Mbekeani JN. Visual Pathway Injuries in Pediatric Ocular Trauma-A Survey of the National Trauma Data Bank From 2008 to 2014. Pediatr Neurol. 2018 Apr 19. [Medline]. Bodanapally UK, Shanmuganathan K, Shin RK, et al. Hyperintense Optic Nerve due to Diffusion Restriction: Diffusion-Weighted Imaging in Traumatic Optic Neuropathy. AJNR Am J Neuroradiol. 2015 Aug. 36 (8):1536-41. [Medline]. Reddy RP, Bodanapally UK, Shanmuganathan K, et al. Traumatic optic neuropathy: facial CT findings affecting visual acuity. Emerg Radiol. 2015 Aug. 22 (4):351-6. [Medline]. Chaon BC, Lee MS. Is there treatment for traumatic optic neuropathy?. Curr Opin Ophthalmol. 2015 Nov. 26 (6):445-9. [Medline]. Edwards P, Arango M, Balica L, et al. Final results of MRC CRASH, a randomised placebo-controlled trial of intravenous corticosteroid in adults with head injury-outcomes at 6 months. Lancet. 2005 Jun 4-10. 365(9475):1957-9. [Medline]. Levin LA, Beck RW, Joseph MP, et al. The treatment of traumatic optic neuropathy: the International Optic Nerve Trauma Study. Ophthalmology. 1999 Jul. 106(7):1268-77. [Medline]. Steinsapir KD, Goldberg RA, Sinha S, et al. Methylprednisolone exacerbates axonal loss following optic nerve trauma in rats. Restor Neurol Neurosci. 2000. 17(4):157-163. [Medline]. Steinsapir KD, Goldberg RA. Traumatic optic neuropathy: an evolving understanding. American Journal of Ophthalmology. 2011. 151:928-933. Yu B, Chen Y, Ma Y, Tu Y, Wu W. Outcome of endoscopic trans-ethmosphenoid optic canal decompression for indirect traumatic optic neuropathy in children. BMC Ophthalmol. 2018 Jun 26. 18 (1):152. [Medline]. [Full Text]. Yu-Wai-Man P, Griffiths PG. Steroids for traumatic optic neuropathy. Cochrane Database Syst Rev. 2013 Jun 17. CD006032. [Medline]. Cook MW, Levin LA, Joseph MP, et al. Traumatic optic neuropathy. A meta-analysis. Arch Otolaryngol Head Neck Surg. 1996 Apr. 122(4):389-92. [Medline]. Note the proptosis induced by the large accumulation of intraorbital emphysema. Also, note the relatively nondisplaced nature of the medial orbital wall fracture. This patient experienced a threatened central retinal artery obstruction due to this condition. Evacuation of the orbital air relieved the compromised retinal circulation. Fundus photograph of a 24-year-old man with vision loss following blunt periocular trauma. The incident occurred during a baseball game when the patient (a base runner) collided with the catcher. The area of opacification extending from the temporal aspect of the optic nerve head represents retinal ischemia and is indicative of an anterior ischemic optic nerve injury. Such injuries may have a better long-term visual prognosis than posterior ischemic optic neuropathies. Indirect traumatic optic neuropathy more commonly results in posterior optic nerve injuries. Posterior injuries usually do not result in any morphologic change to the optic nerve head appearance. Axial CT scan of the orbit. Note the mildly displaced fracture at the junction of the posterior medial orbital wall and optic canal. Fundus photograph of the left eye in a 33-year-old male who suffered a severe head injury after falling off a ladder one year prior to presenting to our clinic. The patient has a visual acuity of counting fingers (CF) of 6 feet in his left eye and a large relative afferent pupillary defect. Note the optic nerve's pale appearance.